Profitability in the property/casualty insurance industry rebounded sharply in 2012, despite $35 billion in insured losses from catastrophes, the majority of those from superstorm Sandy, according to I.I.I. president Dr. Robert Hartwig. In his commentary on the industryÃ¢â‚¬â„¢s 2012 year-end results, Dr. Hartwig says that the improvement was propelled chiefly by a growth in premiums and aÃ‚ drop in both private insurer catastrophe and noncatastrophe related loss and loss adjustment expenses. The industryÃ¢â‚¬â„¢s overall net income after taxes (profits) surged by 72.3 percent in 2012 to $33.5 billion from $19.5 billion in 2011, pushing the industryÃ¢â‚¬â„¢s return on average surplus to 5.9 percent for the year, up from 3.5 percent in 2011. Despite paying $35 billion in catastrophe losses Ã¢â‚¬“ the fourth highest year on record on an inflation adjusted basis Ã¢â‚¬“ the industry benefited from a 4.3 percent jump in net written premiums, nearly a full point above the 3.4 percent gain a year earlier. This was the strongest growth so far recorded in the post-crisis era, according to Dr. Hartwig. In another sign of strength, overall industry capacity (policyholdersÃ¢â‚¬â„¢ surplus) rose to a record $586.9 billion as of December 31, 2012 Ã¢â‚¬“ up $33.1 billion or 6.0 percent from $573.0 billion as of year-end 2011. The fact that the industry was able to rapidly and fully recoup its losses from 2011 and reach a new record high in terms of capital strength in 2012 despite Sandy is further evidence of the P/C insurance industryÃ¢â‚¬â„¢s remarkable resilience in the face of extreme adversity. Despite a growing awareness of the risks, six in 10 companies lack cyber liability insurance, according to an annual survey by Towers Watson. The increasing number of cyber attacks, along with breaches in security and privacy, are forcing corporate risk managers to reconsider how they protect their companyÃ¢â‚¬â„¢s data and proprietary business information. Towers WatsonÃ¢â‚¬â„¢s Risk and Finance Manager Survey found that the average policy limits purchased for network security/privacy liability policies were $18.1 million Ã¢â‚¬“ a significant 46 percent increase year over year. In addition, nearly two-fifths (39 percent) of respondents purchased network security/privacy liability policies, up 11 percentage points from last year. When asked why they had not purchased a policy, some 31 percent (a 10 percentage point decrease from last year) said their internal IT department/controls were adequate. Towers Watson warned that the financial and reputational costs companies face could be enormous if they donÃ¢â‚¬â„¢t develop comprehensive risk strategies to thwart cyber attacks. Towers Watson’s findings are in lineÃ‚ with a new report from the Insurance Information Institute (I.I.I.) that notes that despite broad awareness that cyber risks and cyber security are a serious threat, a majority of companies today still do not purchase cyber risk insurance. However, this is changing, according to the I.I.I. Recent industry analysis suggests that more companies are now purchasing cyber coverage and that insurance has a key role to play as companies and individuals look to better manage and reduce their potential financial losses from cyber risks in future. Download Cyber Risks Ã¢â‚¬“ The Growing Threat. Media reports over the weekend suggest some residents were allowed back to their homes days after a Texas fertilizer plant explosion left 14 dead andÃ‚ more than 160 injured. A fire last Wednesday at the fertilizer plant in West, Texas, some 80 miles southeast of Dallas,Ã‚ triggered the deadly explosion, though investigators have yet to pinpoint the exact cause. The United States Geological Survey (USGS) recorded the explosion as a 2.1-magnitude tremor. GCCapitalIdeas hasÃ‚ aÃ‚ summaryÃ‚ of the event here. Satellite images on the PHOTOblog at NBC news via DigitalGlobe show West, Texas before and after the explosion. More than 150 buildings were damaged or destroyed in the explosion. Business Insurance reports that in the wake of the disaster, questions about risk management planning adequacy and insurance coverage abound. It quotes Joe Woods, vice president of state government relations for the Property Casualty Insurers Association of America, saying that the incident could trigger a broad range of insurance coverage that includes commercial property, business interruption, third-party liability, health and personal lines. PC360 also reports on the insurance implications of the event here. Check out I.I.I. facts and statistics on man-made disasters. While insured property losses from the Boston Marathon bombing are small, the insurance of sports events is likely to be impacted, according to catastrophe modeling firmÃ‚ RMS. Dr. Gordon Woo, catastrophist at RMS noted that the shortage of terrorism insurance cover in the years after 9/11 had led to the securitization of the cancellation risk of the 2006 FIFA World Cup. Dr. WooÃ¢â‚¬â„¢s comments came as investigators moved closer to identifying possible suspects in MondayÃ¢â‚¬â„¢s bombing which left 3 dead and more than 170 injured. RMS says most of the property damage appears to be within 10-20 feet of the explosions, and insured property losses are unlikely to exceed $1 million. However, it believes the costs of business interruption as a result of security restrictions made after the event may be a larger source of insurance claims. RMS noted that the use of smaller sized lethal explosive devices has been the preferred attack mode in recent terrorist plots. Street events, like the marathon, are inherently vulnerable because while they are very large crowds public access is unrestricted. Global Reinsurance has more on this story. While itÃ¢â‚¬â„¢s too early to answer many of the questions arising from twin explosions at yesterdayÃ¢â‚¬â„¢s Boston Marathon, what we do know is that three people are dead and more than 140 injured in the bombings. Our thoughts and prayers are with the victims, all those injured and their families. The Boston Globe reports that much of Back Bay is locked down to protect the crime scene and the investigation underway is being directed by the FBI. Boston.comÃ¢â‚¬â„¢s Big Picture has images of the scene at the finish line of the marathon. Right now, it appears the White House is describing the incident as a potential terrorist attack. Insurance Information Institute (I.I.I.) president Dr Robert Hartwig narrowly missed the blasts after watching his son cross the finish line of the marathon more than an hour earlier. In an interview with PC360, Dr Hartwig said it was too soon to know the insurance implications of the event, but it looked like damage to property was light. Dr. Hartwig added that injured public safety and marathon workers would certainly be covered by workers compensation. An I.I.I. advisory suggestsÃ‚ reporters with questions about the potential insurance implications of the Boston Marathon explosions contact Dr. Hartwig. Check out the I.I.I. website for further updates. While the dangers of texting and driving get a lot of headlines, you might be surprised at the findings of a new study by Erie Insurance that show daydreaming behind the wheel is even more dangerous. 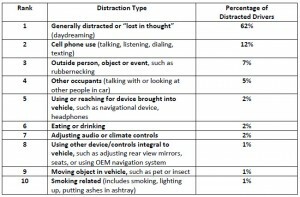 ErieÃ¢â‚¬â„¢s analysis found that 62 percent of distracted drivers involved in fatal car crashes were described by police as daydreaming or Ã¢â‚¬Å“lost in thoughtÃ¢â‚¬ . The police report data analyzed by Erie in the Fatality Analysis Reporting System (FARS) reveal that of the more than 65,000 people killed in car crashes over the past two years, one in 10 were in crashes where at least one of the drivers was distracted. Erie didÃ‚ point outÃ‚ that because FARS data on distraction is based largely on police officers’ judgment at the time of the crash, and because some people may be reluctant to admit they were distracted when being interviewed by police after a fatal car crash, the numbers are difficult to verify and may, in fact, under-represent the seriousness and prevalence of driving distractions. An active 2013 Atlantic hurricane season appears likely based on the latest predictions of the major forecasters. In its just-released forecast, Colorado State UniversityÃ¢â‚¬â„¢s Tropical Meteorology Project is predicting 18 named tropical storms, including nine hurricanes and four major hurricanes (Category 3-4-5). Meanwhile, London-based consortium Tropical Storm Risk is calling for 15 named storms, of which it predicts eight will become hurricanes, and three major hurricanes. TSR forecasts Atlantic basin tropical cyclone activity at about 30 percent above the 1950-2012 long-term norm, but slightly below the recent 2003-2012 10-year norm. And Weather Services International just issued its forecast of 16 named storms, nine hurricanes and five intense hurricanes, but added that this still may be a bit conservative if the warm tropical ocean temperatures persist heading into the season. Updated forecasts will be released around June 1, when hurricane season opens. Artemis blog has a great round-up of the latest forecasts on its 2013 Atlantic Hurricane Season page. Large U.S. commercial insurance buyers are being hit with rate increases and no longer assured of a more competitive price, according to the latest analysis from online insurance exchange MarketScout. Richard Kerr, CEO of MarketScout noted that while historically brand name or large accounts have benefited from more aggressive pricing, in March 2013 underwriters more frequently charged an appropriate premium. Kerr added that large account pricing is the subject of considerable chatter among underwriters so MarketScout will be monitoring the situation very carefully. TheÃ‚ survey foundÃ‚ that the commercial insurance rate index for the United States rose 5 percent in March 2013. WorkersÃ¢â‚¬â„¢ compensation, professional and small commercial all received more aggressive month-over-month price increases, MarketScout said. By industry class, manufacturing continues to post the largest rate increases as compared to prior year results, followed by contracting, service, habitational, and transportation. Insurance JournalÃ‚ has more on this story. Check out latest I.I.I. information on financial and market conditions.